The A6 is the second best seller from the German car maker Audi. Cars from Audi have a great amount of grace and a lot of elegance to them. The Audi brand was better known as Cricketer Ravi Shastri’s car in the 80s, the Audi 100 that he won as the Champions of Champions Trophy in Australia also happens to be a predecessor of the A6. Audi India has increased its tempo lately and has wasted no time in getting the latest generation of the A6 to India. It launched the New A6 a few weeks back. The New A6 is in its seventh generation now. The A6 first appeared in 1994 codenamed as the C4 followed by the C5 that was launched in 1997. In 2004 Audi got the Typ 4F codenamed as the C6 and that is the variant that this New A6 replaces. The A6 has always been a very smart looking Executive Luxury Sedan well known for its build quality, comfort and superior ride quality. Many felt that the out- going A6 lacked the bite and needed a bit zing to qualify as a very good driver’s car. We drove the All New Audi A6 the 3.0 TFSI which is the top of the line variant for the A6 currently to find out how the New A6 is really different from its earlier generations and if it has the zing to qualify as the best driven car in the segment. Read on as we take you through the New A6 experience. The New A6 looks classy from the front. The perfect Audi family look is very evident and the front face reminds you very much of the elder brother the A7 Sportback and the A8 in many ways. The typical Audi French Beard grill that goes low makes up for most of the face for the Audi A6 upfront. The grill gets a thin chrome garnish that runs around it and highlights the overall design. The 4 ring Audi logo on the front grill has gone much bigger and now looks prominent and inviting. The Audi grill has seven horizontal slats that run across till the edge low slung bumper. As with the newer Audis there are no Fog lamps installed on the bumpers and instead the headlamps have the fog lamps integrated in them about which, we would speak later in detail. The styling is soft and the lines are nice and easy on the bonnet. You get headlight washer that’s integrated in the front bumper. Akin to the A7 Sportback and the A8, the A6 also gets the latest Audi headlamps. Audi has always been known for the uniquely designed LED headlamps and taking cues from the A8, the design of the LED headlamps have gone a way ahead in terms of styling and technology. The New A6 gets the latest Curved Wing LED headlamps that have Xenon Plus along with LED technology combined with hard plastic contour vapor coated housing. There’s a separate high-beam assist for these Xenon-Plus headlamps. Xenon Plus includes DRL (Day Time Running Lights) on the curved wing design that looks amazing even in stark daylight. These are all weather lights and have a color temperature of 5,500 Kelvin. Audi claims these headlights to be maintenance free and consuming just 40 watts per unit of power every time. The A6 also gets the latest Adaptive lighting that adapts the light according to the ambiance automatically. The curved wing has 60 LEDs and the DRL also doubles up as the turn lights with soft orange LEDs glow, thus making for an impressive look. Getting back to the exterior styling, the New A6 is 4.92 meters in length and 1.87 meters in width while it is 1.46 meters in height. The New A6 looks sleek and very trendy. The bonnet as mentioned has soft lines; the fenders are long and give prominence to the A6 when viewed from the sides. There’s a sharp edgy line that starts from the headlamp and passes through the front fender, doors and then merges on the boot with the tail light. The Doors are large and the New A6 gets huge glass area all around. The New A6 runs on 17 inch tyres mounted on 10 spoke alloys. The New A6 gets 255/55R17 Pirelli Cinturato tyres. The wing mirrors also flaunts their new shape and resemble the A7 Sportbacks mirrors; they also have integrated LED turn lights in them. Seen from the side, the New A6 seems a bit lower than its predecessor making it sportier to view. The windows get a nice anodized aluminum - chrome detailing enhancing the profile further. The roof arch has a flat dome while the C pillar extending to the flat rear windshield that’s at a flat angle. Coming to the rear the New A6 gets some fresh design treatment; the rear now gets an integrated lip spoiler on the boot. The all new tail lamps are flushed in the body types with LED lamps that glow for stop, turn, reverse and rear fog all in LED making the sedan very pretty to look at in any light condition. The tail lamps extend itself in the boot lid; the boot height is a bit low as compared to the earlier A6. The bumper is low slung with twin round exhausts in chrome. The boot gets the Audi rings on the center and the A6 monogram on the left and 3.0T Quattro on the right. And not forgetting the sun roof that comes as a part of the standard equipment on the A6. The roof also gets a plucky radio antenna which looks nice and sporty. Audi uses light weight materials on its body panels thus reducing about 30kgs which automatically helps in enhancing the power to weight ratio which in turn accelerates performance and fuel efficiency. Overall the New A6 impresses in the design department, the A6 is a lot sportier to look at from any angle and its lowered height adds to the overall sports appeal. The elegant part is balanced perfectly with the all new headlamps, the touch of chrome and the thick sharp waist band that runs on the sides of the A6. The Audi A6 cabin feels a lot like the cabin of the A7 Sportback and somewhat even like the A8. Dark Tan leather upholstery on the seats and door panels of superior high quality feels good to touch. The front seats are all electric and can be set for height reach, tilt lumber etc. The front seats are wide and perfectly contoured offering good support upfront. The under thigh and lower back support is good. The center arm support is also larger on the New A6 and your co driver can share the arm rest as well. Rear seats are perfectly contoured and comfortable for two and even a third passenger can easily fit in. There is large head room at the back and good amount of shoulder space too along with enough leg room for the rear passengers even with the front seat pushed back fully. The dash of the New A6 looks and feels a lot like the A7 Sportback which is a big compliment. The dash is made of soft rubbery material that looks classy and feels good to touch. You get a thick band of wood insert on the dash with Quattro inscribed on it. The four spoke steering is again from the A7 Sportback with aluminum pin stripping on it. The steering has the usual multifunction controls for music, telephony, etc. The speedo cluster has a multi display type LED in the center that toggles between various parameters at different times. The speedo and RPM start with a 6 o clock position with red needles on them. The RPM on the left is calibrated till the 8K RPM with the red line marked at the 6.5k mark. The Speedo is calibrated till the 300KMPH mark. You get the engine temperature gauge on the left and the fuel gauge on the right having white LED steps to show the readings. One can find paddle shifters on the New A6 and the cruise control stalk is just behind the steering on the left side. The only grouse we had is that the steering is manually adjustable for reach and height while we would have preferred an all electrical adjustable steering. The center dash houses the 6.5 inch LCD display that’s motorized and can be pushed in the dash when not needed-a thing very similar to the A7 Sportback and the A8 which has a slightly larger screen. As with the current generation Audis, the A6 now gets the latest generation MMI control module that controls the various settings for Music-FM- DVD, GPS, Suspension setting and drive settings, Telephony and lot of other vehicle dynamics. Just under the LCD screen you get the AC vents that have wood inserts and aluminum strips around them. The single CD/MP3 player is placed under the AC vents combined with a card reader. You get 4 zone climate controls on the new A6, two zones for the front and two for the rear cabin. The center console is again very similar to the A7 Sportback with an all new shaped gear shifter. The engine start stop button is on the left of the shifter and the MMI controls just behind the shifter. You also get a dedicated volume control dial on the center console and a touch pad that also doubles up as a contact finder when using your telephone. The A6 also has the Auto Hold and Electro Handbrake as standard equipment. There’s also a 6 DVD changer in the glove box adding more punch to the entertainment equipment list for the new A6. As mentioned, the rear passengers get 2 separate temperature zones with AC vents in the center and also on the door pillars. The A6 has an overall boot capacity of 530 liters. The New Audi A6 that we drove comes with a 3.0 Liter (2995cc) V6 Supercharged Petrol engine that makes 300 HP and delivers prodigious 440Nm of torque between 2900 and 4500 RPM. This mammoth engine is coupled to an all new 7 speed S-Tronic and Quattro (all wheel) drive. The reduction in weight-thanks to usage of lighter body panels-helps in much better power-to-weight ratio and the Audi A6 can do a dash to 100kmph in 5.5seconds and has a limited top speed of 250kmph. The new A6 gets the 7 speed S-Tronic Dual Clutch gearbox that’s capable of lightening fast gear shifts helping in quick acceleration and fuel efficiency. This new S-Tronic transmission uses a dual clutch mechanism in which the first clutch shifts the 1st, 3rd, 5th and the 7th gear only while the second clutch shifts the 2nd 4th and the 6th gears thus making the up and down shifts super fast and highly smooth and unnoticed. The S Tronic gearbox has Fully Auto, Drive and Sport modes to choose from. The gear ratios and shift pattern change accordingly. Depress the engine start button and the 3.0 Liter V6 comes to life with a meaty Vroom roar. Shift to the Drive mode and the A6 is off, the first thing you notice is that the New A6 drives and feels a lot different to the earlier A6. Things have gone from good to better to best, the feel is tremendously different and it’s fun to drive in any drive mode. The new A6 feels very hot to drive and the car feels very different and very driver oriented. Speed builds up instantly; if you are a petrol head then this new A6 will bring a big grin to your face almost instantly. The A6 now does not feel like its predecessor, in fact it does not feel anything like the earlier Audis at all. It’s full of fun and gives immense pleasure to the driver and occupants too with its instant speed build up. We did a speed of close to 170kmph on our short run and the A6 was as composed and calm as it would be at speeds of 20kmph. Handling has improved by 100% and the braking too is top notch. It is fun to drive in the various preset drive modes. You can choose from Efficiency, Comfort, Auto, Dynamic and Individual presets. The gear ratios and the suspension setup alter accordingly. You get all the needed safety features stuffed on the New A6. There is minimalistic body roll felt in the A6 cabin and the vehicle corners sharply. The steering feedback is near to perfect. The A6 gets an all new air suspension setup that is much better and it creases out the bad roads very nicely. You can increase or decrease the car height as per the drive mode you select and on plain tarmac too the A6 feels planted as the speed increases and even at speeds of 170Kmph you feel you are doing 60-70kmph; at times that’s how secure the drive really is. The all wheel drive or the Quattro helps in traction control and handsomely keeps the A6 planted to the tarmac. The Audi A6 is the safest A6 till date with a host of safety features. The new A6 gets two front, two sides, two head airbags, four belt tensioners, an integral head restraint system, five head restraints along with ABS with EBD, EPS, adaptive lights, front and rear park sensors with rear camera with intelligent parking module for driver assist. Cars from Audi are known for their comfort and elegance, but with the new A6 Audi wants to change the rules of the game. The New A6 now is a total driver’s car unlike its earlier counterparts. The New A6 can drive like a maniac if you want it to. At the same time, it can also drive you in grace and elegance when needed. The equipment and cabin is as good as the A7 Sportback enhancing the value of the new A6. Quality, fit and finish have always been a hallmark for Audi and things have gone better from there with the new A6. With much better driving characteristics, long list of equipment and safety equipments come on-board with the A6. Prices starting at Rs. 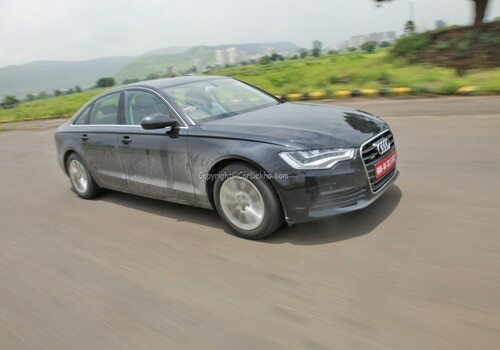 37.50 lakhs, the Audi A6 is the best value for money car currently in the segment. Needless to say the New A6 is the best fun car to drive from the current Audi lineup of their sedans.